In the 5th and in the 6th century Byzantine was the most powerful country on the Balkans. Big influence on this Empire has had, not only the battles, but also the ethnic changes. After the attack of the Huns, came the Germans and they attacked too. The influence of the German tribes was so powerful, that could even be felt in the army, in the state and also even during choosing a ruler. But in the period of the ruler Leon 1st (457-474), who became ruler helped by the Germans, an Anti-German movement was raised in Carigrad (Istanbul today), supported by the Ysavrians. 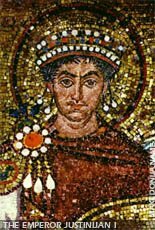 Later ruler on the Byzantine throne, became Zenon (476-491), exactly in the period when the Western Roman Empire, fall under the rule of Odoakar. By the moving of the Germans in Italy the ethnic problem in Byzantine was completely solved, but now there was other problem bigger, the religious opposites. By the coming of Anastasius (491-518) on the throne, the ethnic problem was solved by moving of the Ysavrians in Thrace. In the period of his rule the state administration got better. A lot of things got betters... But Anastasius didn't solved the religious problem, but the ethnic crisis was solved so he wanted to back their western territories, which were settled by the "Barbarians". Political target of the new emperor Justin 1st (518-527) was to put back the lost territories of Byzantine. The same politic was spread by his cousin Justinijan 1st (527-565). He was born in a place Taurisius (Taor village), today near Skopje. He was the founder of the mysterious episcopacy city dating from the 6th century, Justinijana Prima. When the Slavs arrived on the Balkan Peninsula, they lead several great battles even among them and the Roman-Byzantine union. The offensive battles were always played on the Byzantine territory which was later, settled by the Slavs. The Slavs around 517 AD, took part in the battles, they weren't mentioned by their real name, but as Gety. They marched on south until the Thermopiles in Greek land. All this happened during the rule of Justin 1st. But a German, cousin and strategical man of Thrace has defeated them and put fear. The consequences were... no more attacks during the rule of Justin 1st. But from the period of Justinijan 1st, the attacks organized by the Slavs and the Anties, got large territories Illyria, Thrace and the all parts of the Adriatic coast, until Carigrad and the area of Herzones. But, after a short period a battles raised between the Slavs and the Anties. And normally, the Slavs have won. But that didn't stopped the Anties to enter the Thrace region in the period of 540-545. But soon they made an union again and they had contacted each other. But in the period of 544 a lot of Huns tribes settled in the Byzantine part of Illyria. Now the ruler Justinijan 1st, changed his policy. Now he offered the Anties territory and gold if they stop the Hun entering in the Byzantine territory. But the Anties wanted more territories and after they crossed the river Danube, they started to rob and kill the population. So in 545 AD they were defeated by the Herkuls (who lived in the region Belgrad), paid army by Byzantine to defeat them. This defeating of their ally, didn't stop the Slavs, the Slavs to penetrate in the Balkans. But, opposite they crossed Danube and were killing, robbing and kidnapping people all the way to Duress (Drach). They burned and killed a lot of the Illyrians. They also conquered many important cities and ruined them. In 549 AD they crossed the river Danube with an army of 3,000 people. When they crossed the river Marica, they separated on two troops. Even that they were less than the Byzantines they defeated them in Illyria and Thrace. They went on south even to the Aegean Sea. All over these territories they had done: "they beat all men 15,000 and stole all the treasures, and from the all women and kids made slaves". As soon as, the emperor Justinijan discovered that they are not only walking through his territories but settling, he ordered to German to stop their attack. But the Slavs canceled their battle against Byzantine and moved on the Illyrian hills and conquered Dalmatia. But German suddenly died in 550 the autumn and the Slavs entered the Byzantine territory. Not having any army hired against them they came to the Long Wall, which is one day walking from Carigrad. In the period of 552 to 558 no source can tell us of Slavic entering. In 558-559 the Slavs entered again now in Greek territory and also Illyria, Macedonia, but now supported by the Hunic Kurtiguri. So they were robbing and killing and later got home in the in Danube fatherland Sclavineae.